Transform your summer-dry hair this hot season with the newest Cream Silk Fresh Hydration Conditioner. With Advanced Hair Reborn Technology and Hydra-Collagen Complex, it makes rough, frizzy, and summer-dry hair feel fresh and hydrated for up to 24 hours of long-lasting freshness without the greasy feel. Directions: After shampoo, massage through hair especially on ends. Rinse well after 1 minute. Use every day for best results. FULL SIZES: 11ml/ 170ml/ 340ml PRICES: PHP 6.50/ PHP 109.00/ PHP 197.50 AVAILABLE AT: Available in Lazada, IamClaire and all major supermarkets & sari-sari stores nationwide. 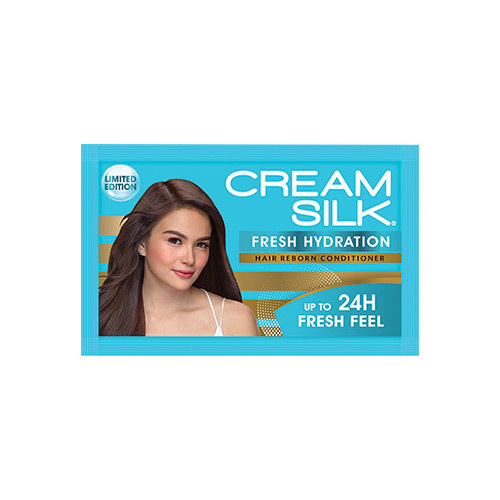 SOCIAL MEDIA: Facebook: https://www.facebook.com/creamsilkph Twitter: https://twitter.com/CreamSilkPH Instagram: https://www.instagram.com/creamsilkph Get your sample at Sample Room!